There are many features within Optik TV that make it a pleasure to use. People often say how great it is to cut the cord, but then you miss out on improvements and innovations brought to the traditional television experience. Like any software out there, Telus is always making improvements and upgrades to Optik TV. Telus rolls out updates and new features on a regular basis and with that, we get the “restart” feature. Perhaps it’s something you haven’t delved into or don’t know that much about. I will review this new feature and provide some tips and tricks to get even more benefits out of it. 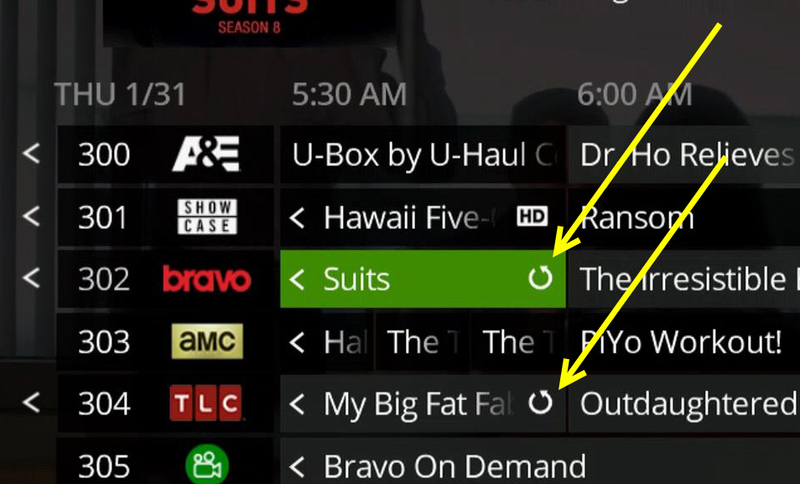 When viewing the Telus Optik TV guide look for the circle icon as shown in the image above. You can scroll back in time (just press left directional button on remote) and find shows that you can restart and watch. I will talk a bit about news shows because that is my most common usage of the restart feature. News isn’t an ideal program to record on a daily basis as the PVR can run out of storage awfully quick. This isn’t just about news shows though. If you have shows on a regular basis that you seem to miss and forget about, the same benefits can be had. Here is scenario that I experience on a regular basis. I wake up in the morning and want to watch local morning news only to realize it’s over. The restart feature means I can go into the guide and scroll back in time, find the show and restart it. Note: not every show is available to restart which is something I will discuss later in this article. Another common scenario is missing the start of a show. It’s super annoying and it’s something that happens to everyone. The restart feature solves this problem and let’s you go back to the top of the hour and watch the start of the show. The restart feature is a snap to use too. Simply grab your remote and get to your channel using any method including: guide, keying in channel number, or scrolling up/down through channels. No matter how you end up on your desired channel, the process is one click only. When you get to your desired channel, pressing the OK button on the remote will automatically restart the show from the start. All you do is press the “OK” button on the remote while info overlay (pop-up) appears on the channel when you first arrive on it. Don’t panic if you miss the pop-up because you can click the guide and select the show with the OK button and then press the OK button again to initiate the restart of the show. See the image below. While the info pop-up is showing, the Telus Optik TV software automatically has “restart” highlighted for you when you first arrive on a channel. This simplifies the process significantly. It’s seamless and painless. One drawback of the restart show feature is that you cannot fast forward. You can pause and rewind but no fast forward means you’re going to be watching the commercials. Advertisers will obviously appreciate this and for the user, call it the cost of convenience. One trick that I use to work around the lack of fast forward is to start recording the show first. Then after initiating the recording, I restart the show. I just watch the show up until the time I started to record it on the PVR and then switch over. At that point I can save time with the fast forward button once again. Another tip is to use the restart show feature as a way to rewind from live television. Don’t be confused with the standard Telus Optik TV feature that buffers up to 90 minutes of television on your PVR. That feature only works if you have stayed on the same channel and starts buffering from the time you arrive on the channel. Making use of the restart feature doesn’t require you to have been on the channel prior. To rewind from live television, when you get to your channel, do not initiate the restart show. Instead, you must let the overlay disappear. When it does, then press the rewind button. You will get a pop-up saying that you cannot fast forward, which you can ignore. This pop-up notification is a slight nuisance because it interrupts your initial rewind and you will need to press rewind a second time to start rewinding. You can rewind at regular speed, 2x speed and 3x speed. Be careful on going too fast especially if you’re looking to avoid commercials. Remember you won’t be able to fast forward if you miss your mark! As mentioned previously, the restart features does requires network permission. Thus, there is a mixed bag of shows that support the restart feature right now. It’s such a user friendly feature I would love to know their reasoning for not getting on board. At the time of writing, a majority of Global shows support the restart feature but unfortunately Global news is not supported. Well, it is somewhat supported. If you can catch the news while it’s on, you can access the restart option. It’s not quite as handy as going back after the news ended, but it’s better than nothing. For whatever reason, CBC has very few shows that support the Telus Optik TV restart feature. Not surprisingly, many CBC shows can be found on their website or on demand. Both CTV and City TV has excellent support. In particular if you care about news, they both allow the restart feature. I’ve decided to watch these channels more often as a way of supporting them for embracing restart. I do like Telus Optik TV because they introduce improvements that push the bar higher. They obviously see the cord cutters out there and know that they need a compelling product and keep on improving it. Hopefully the restart feature is something you can incorporate into your viewing habits and find it as convenient as I do. Telus internet data limits, overage charges, fees. What you need to know.